Just after Christmas in 2003, I traveled alone to Paris, Venice, and Rome. I had just started my first full-time job as a web developer in May. I was living with my mom at the time so most of my salary went directly to savings. My first two major purchases as a career adult were a new digital camera (a Canon PowerShot G2 with its amazing swivel screen) and this trip. I’d been to Paris briefly before in high school with my youth group. We spent a couple days there, but the highlight of that first trip was an afternoon at Notre Dame. I was instantly entranced by the sheer amount of detail in every nook and cranny. It was a colossal act of love made real, by thousands of hands and centuries of refinement. On my second trip to Paris, Notre Dame was at the top of my list. 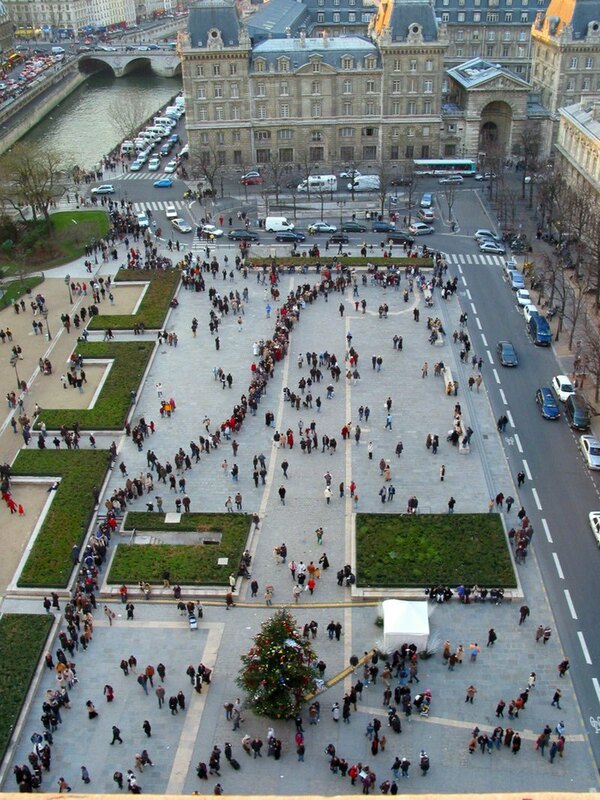 I arrived there on my third day in Paris shortly after lunch. I took some time to walk around and bask in its beauty. I saw a line to ascend the steps and see the bell towers that stretched from the side of the cathedral across the entire square. I nearly skipped it, but realized that since I was by myself, I could spend my time however I wanted. 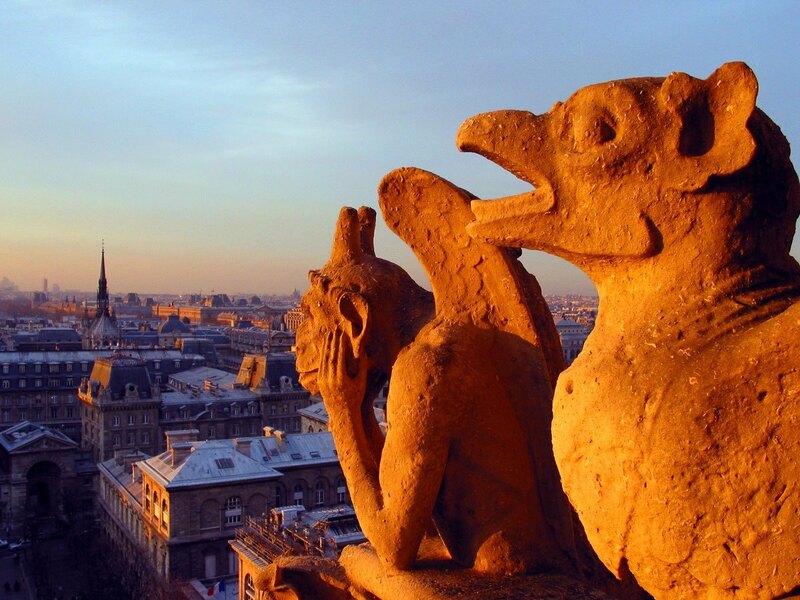 And I wanted to see the top of the bell towers, the gargoyles, the chimeras, and the roof. I don’t remember how long I waited, just that it was a long wait. As the sun began to dip toward the horizon, I worried that they’d close the bell towers before I reached the base. Some people ahead and behind in the line began leaving, perhaps hoping to spend more time enjoying the cathedral from the ground. But after waiting for so long, it seemed daft not to see it through at this point. It was nearly sunset when I walked into the tower and began the climb. I don’t remember how many steps I took to reach the top, but the Internet tells me it’s 387. That’s almost 30 floors. It’s not impossible, but it’s certainly no easy feat. So I kept going up. I walked out onto the belfry as sunset lit Paris with a heavenly orange glow. It was sheer magic. While I soaked in the beauty of it all, I also thankfully had my camera to capture it. Those turned out to be some of my favorite photos of all time, resting on top of one of my favorite places in the world. I’m heartbroken to see that Notre Dame is burning, that its beautiful spire has collapsed. But I’m thankful for the magical moment I spent there. I hope beyond hope that it can be rebuilt, so that others can see its beauty too. This year, I’m getting back to building the things I’m passionate about. I’ve been making some changes around the old digs.